Even before the cold water started to settle around my crotch, I knew this was a bad idea. I’d been trying to photograph Steller’s Sea Lions swimming underwater for the better part of a day, and it was slow going. The novelty of a boat bobbing on its anchor a mile from their haul out had quickly worn off, and I stood for long hours with my underwater camera stuck in the water, photographing precisely nothing. The sea lions were idly playing all around me, they just couldn’t be bothered to come visit. Other pinniped watchers may have packed up and moved on, but I am made of sterner stuff. As soon as I dragged out my scuba dry suit and started flailing around on deck, the sea lions perked right up. By the time, I got ready to step off the boat and into the water, all of us were palpitating. Them with eagerness for a new plaything and me with something approaching mortal dread. I was five miles from shore, 20 miles from any other boat, swept by currents and surrounded by wildlife of unknown temperament. I tied one of the boat’s mooring lines around my waist as a sole concession to safety and dropped into the water. In spite of their curiosity, the sea lions kept a wary distance. I told myself to relax, at least until I noticed the trickle of water coming in around my poorly sealed wrist. The cold water slowly worked its way up my sleeve, across my chest and created a cold, decidely unpleasant pool around my nether bits. Even in summer, the water temperature hovers in the high 40’s. In spite of that, it is filled with a very busy aquatic community in the form of massive plankton blooms. Great for plankton eaters and the circle of life that feeds upon them. Crap for pictures. As I bobbed soggily about, I stared into cold green murk and watched the shadows of sea lions flit past. It’s one thing to try something radically stupid, get cold and wet and scared, and at the end of the day have something to show for the trouble. This was some other thing entirely. I climbed back out of the water, devoted an hour to wringing out my clothes and gear, pulled up the anchor and moved on. This entry was posted on Friday, July 30th, 2010 at 9:20 pm. 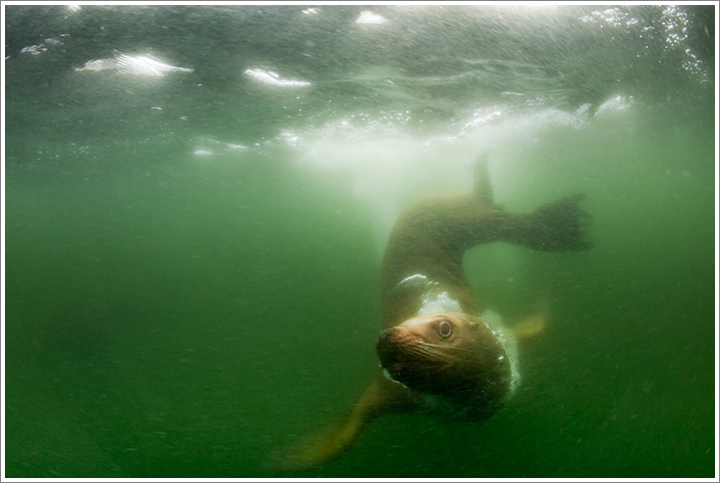 It is filed under Underwater and tagged with Alaska, North America, Scuba, Sea Lions, Underwater, USA. You can follow any responses to this entry through the RSS 2.0 feed.